This is a full set of masks for the Hurricane I. As many of you know, British green/brown camouflage patters came in an A and B scheme which were mirror images of each other. It was decided in late 1940 that only was was really required so the B scheme was eliminated in 1941. 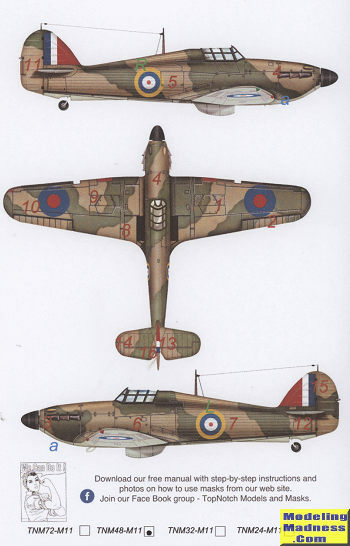 This somewhat limits the use of this set of masks to Battle of Britain and earlier aircraft. 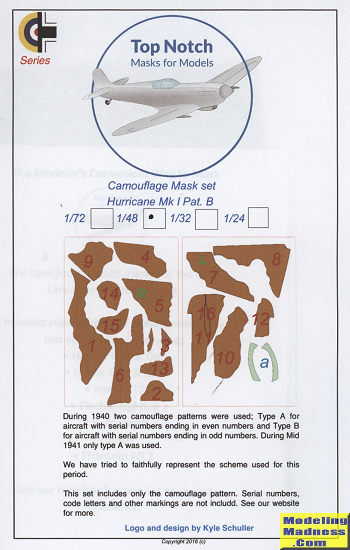 As the schemes alternated according to serial number you have to somewhat careful as to what plane you are using these on. The A scheme was serials that ended in an even number and the B for those that ended in an odd number. The set is very nicely done and you are provided with a placement guide as to what goes where. This is the one area I think could use improvement as I found the letters, which are printed in red, could be rather difficult to see. Perhaps having a black outline around them would be the answer. The images on TNM's web site are easier to read. In this case, one paints the dark earth, then applies the masks and paints the dark green. These are available in all four major scales. This is the 1/48 set.